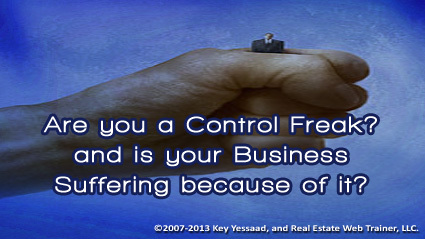 Are you Over-Controlling every aspect of your Business? Does your left hand know what your right hand is doing? This simple question should reveal how much of a control maniac you are, and how you may be chocking opportunities from occurring in your company – you are probably trying to over-control everything in your business, and if you are in the business of people then… oh my! The power of being a Business Owner and an Entrepreneur is the Joy of being able create the future as you see it; but many such entrepreneurs start over-controlling every aspect of every endeavor because they start over-relying on their judgment and doubting the judgment of everyone else. The questions you want to ask yourself are quite simple: What are you afraid of? Has someone let you down in the past and now you have painted everyone as a potential let down in your life? But the most important question you must confront is: Why are you lying to yourself; by first admitting that you need to hire managers and decision-makers; and when you put them in those positions you question and choke every decision they make? – Were you lying to yourself in the first place? Control is not Power – Collaboration creates Opportunity!